When veterinarian Katrin Jahn moved from the UK to Abu Dhabi, she expected to care for cats, dogs, and hamsters. She did not imagine that she would treat an ostrich in a back yard in Khalifa City. Called in to examine the ostrich, she advised its owners about housing and feeding the big bird. The German Veterinary Clinic that Dr Jahn founded celebrated its 10th anniversary last week. And since its first day it has received numerous bizarre requests from appeals to treat cheetahs, lions, monkeys and kangaroos to healing rescued cats. Many calls were in fact declined as the clinic does not treat exotic animals, which requires specialist training. Vets at the clinic have treated 80,000-100,000 animals in the last decade including cats, dogs, snakes, lizards, tortoises, hamsters, guinea pigs and sugar gliders or hand-sized marsupials. There has rarely been a dull moment, like when medical intervention was required to save a cat who had made a meal of flip flops and a dog that gobbled up a toy. “The strangest request we have ever got was to treat a kangaroo. We had to decline as kangaroos are very sensitive animals,” she said. On moving to the UAE in 2006, Dr Jahn realised that although pet clinics were restricted to downtown Abu Dhabi, residential communities were emerging in Khalifa City and Al Raha Gardens. Predicting a surge in demand in these areas, she set up the clinic in the suburbs. “We were one of the first businesses in Khalifa City. When we started there was one spa, a couple of nurseries and a few supermarkets,” she said. Making sure that felines received specialised care was a primary goal of the unit that was the Middle East’s first cat-friendly clinic. Since then other clinics have been established in the emirate that provide the standard of care available in Europe and the United States. 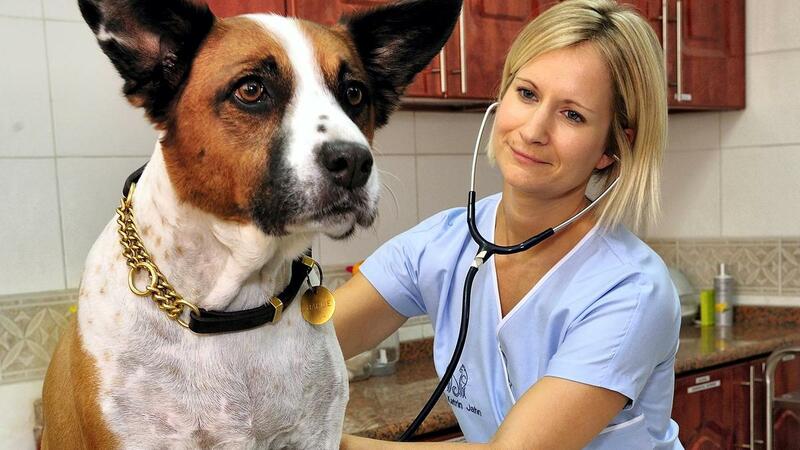 “The last 10 years have seen a rapid growth in the veterinary clinic market in Abu Dhabi. Ten years ago there were only a couple of clinics offering comparable levels of service to what you would find in Europe or in the United States. In the last decade the standard of veterinary care has completely changed,” Dr Jahn said. The vet also highlighted the stray cat problem in the country with cases of pet abandonment worsening lately. The clinic often treats and rehabilitates animals that are left on their doorstep. Almost every member of staff has taken home one or two rescued animals looking for homes and Dr Jahn has two cats who were rescued in Abu Dhabi and a dog who was rescued in Sharjah. “The stray cat population has become more sick. There are more cases of cat flu and feline AIDS. Those problems have become amplified,” she said. Immunodeficiency in cats is more common in street cats and is passed on via saliva where the damaged feline immune system cannot fight infections and diseases. Martin Wyness, founder and owner of the British Veterinary Centre, said a large number of animals are discarded by their owners. “People treat animals as a novelty rather than a commitment. There are kennels full of stray dogs. There are improvements at some levels but it’s not enough,” he said. When Dr Wyness worked in Dubai, he noticed people travelling from the capital to Dubai to treat their pets. He founded the British Veterinary Centre on Old Airport Road in 1991. Since then, the centre has moved to Khalidiyah, with a branch in Khalifa City. “I started a clinic in Abu Dhabi because at the time there was no one working at a very high standard with small animals. Vets at that time were more traditional in thinking and were treating falcons and goats,” added Dr Wyness. The clinic is focusing on education to build the level of expertise in the region.